U.S. Secretary of State John Kerry said Sunday the latest display of brutality by Islamic State militants has prompted a number of countries to offer ground troops to fight the terrorist group. Kerry, in Paris following a Middle East tour to drum up support to fight the group also known as ISIS and ISIL, told CBS' "Face the Nation" the goal is "ultimately to destroy ISIL," ideally with Sunni forces. Kerry's comments followed the release Saturday of a video, purportedly showing the beheading of British aide worker David Haines. The video featured a black-clad executioner who has been identified as a Briton. "We have countries in this region, countries outside of this region, in addition to the United States, all of whom are prepared to engage in military assistance, in actual strikes if that is what it requires. And we also have a growing number of people who are prepared to do all the other things," Kerry said. Kerry said the United States would provide air power but has no intention of putting "troops on the ground." "There are some who have offered to do so, but we are not looking for that at this moment anyway," Kerry said but did not identify the countries. "I've been extremely encouraged to hear from all of the people that I've been meeting with about their readiness and willingness and to participate." If Arab states allied with European and U.S. interests get involved directly in military operations it would be a departure from the less-direct approaches they’ve employed in the past, such as providing intelligence to Western spy agencies, funding foreign military operations and allowing the U.S. military to operate from their territories. Sunni Arab states have expressed support for the U.S. campaign President Barack Obama announced last week to destroy the Islamic State that has taken control over significant portions of Syria and Iraq in its effort to create a fundamentalist caliphate governed by its interpretation of Islamic law. Kerry arrived in Paris Saturday following stops in Egypt, Iraq, Jordan, Lebanon, Saudi Arabia, Qatar and four other gulf states, Reuters reported. France is hosting a regional security summit Monday to be attended by as many as 20 countries, but excluding Iran because of Tehran's support of Syrian President Bashar Assad, Iloubnan.info reported. 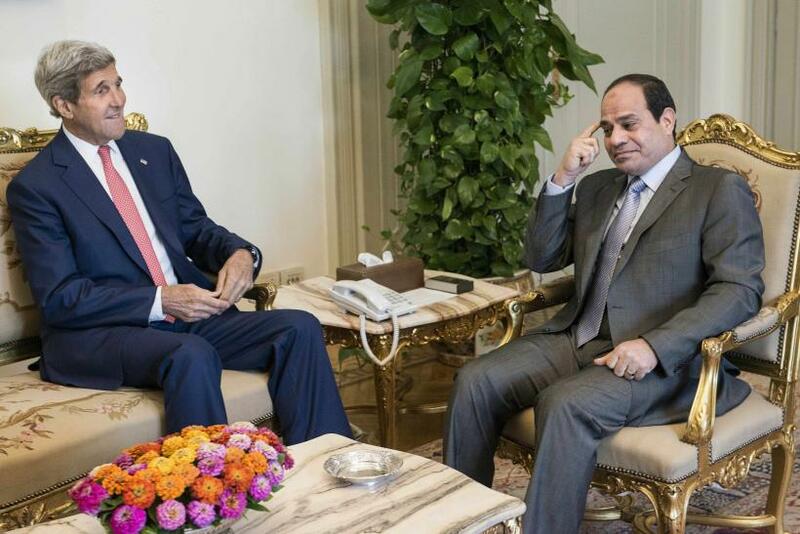 During Kerry's stop in Cairo Saturday, Egyptian President Abdel Fattah al-Sisi urged the United States to include more than just the Islamic State in the fight against terrorism. Sisi and other Egyptian officials said attention should be paid to groups such as the Muslim Brotherhood and Ansar Bayt al-Maqdis, Egypt's most dangerous militant group, Reuters reported. Last month, U.S. officials were caught off-guard when unidentified fighter jets believed to be launched by Egypt and the United Arab Emirates bombed Islamist rebels in Tripoli, the second time this year that Egyptians and Emiratis are believed to have joined forces against militant jihadists in war-stricken Libya. These were unusual acts of intervention for both countries. While Saudi Arabia is a major purchaser of heavy military hardware -- from British Typhoon fighter jets to American Abrams tanks -- the kingdom’s government has been hesitant to engage militarily in fights in neighboring countries.